As such, SYFY went big with The Expanse this year at Comic Con, with not only a panel, but an interactive experience that took place outside of the convention center, and saw long lines each day of the Con. Also maintaining a long line was the panel itself. Fans eagerly awaited discussions about the major twists served up throughout season two, as well as nuggets of intel on what’s to come in season three, and they were not disappointed. 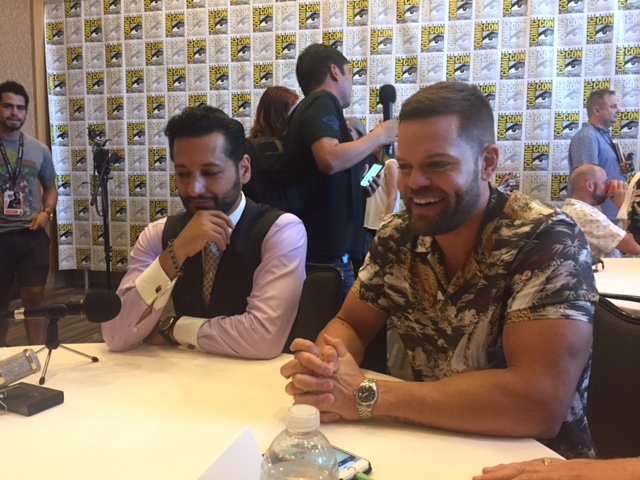 Executive Producers Naren Shankar and Mark Fergus, as well as cast members Steven Strait, Shohreh Aghdashloo, Cas Anvar, Dominique Tipper, Wes Chatham, and Frankie Adams talked about behind the scenes anecdotes, season two’s most shocking moments, and discussed what was coming in season three. During the entire hour, they showed a camaraderie that is rare in larger casts like this, and made the panel enjoyable for everyone in the audience. While fans of the book series were expecting the general outcome of season two, it was still shocking at times, and opened the door for the war between Earth and Mars. Additionally, with a new season usually comes new cast members, and it was announced during the panel that Lost’s Elizabeth Mitchell would be joining the show in a recurring role for season three, playing a character that brings a new, spiritual perspective to the series. 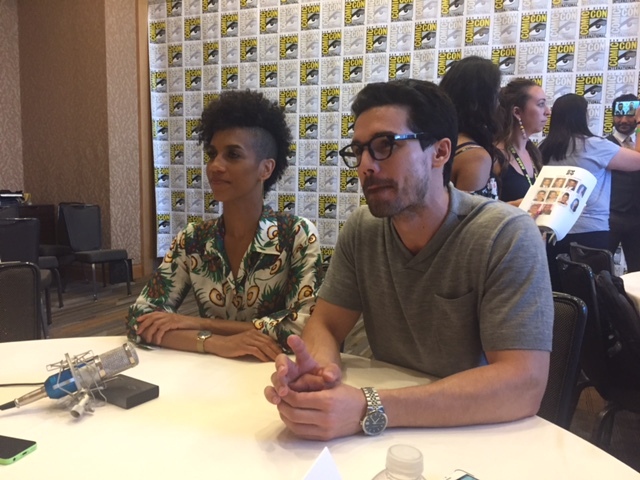 Immediately following the Comic Con panel, ScreenSpy had the opportunity to sit down with the cast and crew of The Expanse, as well as authors Ty Franck and Daniel Abraham (who wrote the series under the pen name James S.A. Corey), to discuss the book series, what has happened and where things are going to go from here. “We rehearse a lot,” said Chatham. “On TV, the pace moves so fast, we don’t want to waste time in the moment of the shoot. In rehearsals is when we throw in ideas and what we say, and work all that out before we get on set so it moves a lot faster.” Adding to the cast’s ability to move faster on shoot days, has been the newer addition of using VR during rehearsals, which helps everyone to visualize what the space will look like when they’re actually shooting. Helping to create that overall look of the show however, is the source material of the books, to which everyone agreed that they’re staying pretty faithful to, including the introduction of fan favorite characters like Miller (Thomas Jane). 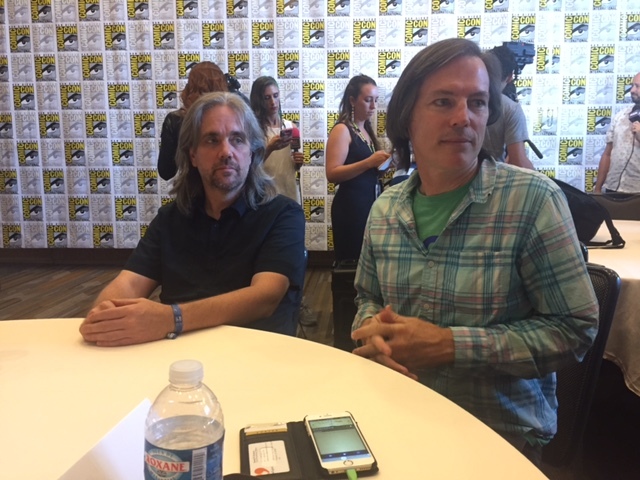 Fergus mentioned that they try to stay close to the trajectory of the books, so since Miller showed up in book three, there’s a good chance he’ll show up later this season on the show. And because the show is so faithful to the books, many of the cast members have read them. Chatham however, only reads a book a season, because he doesn’t want to get too far ahead of where they’re at. “It gets in the way of discovering new scripts,” he said. “When you start thinking ahead in the future, it takes away from playing in the moment.” Chatham does use them however to help build out his character Amos, but doesn’t find himself confined to any of the choices Amos makes in the books. The Expanse returns to SYFY in 2018.